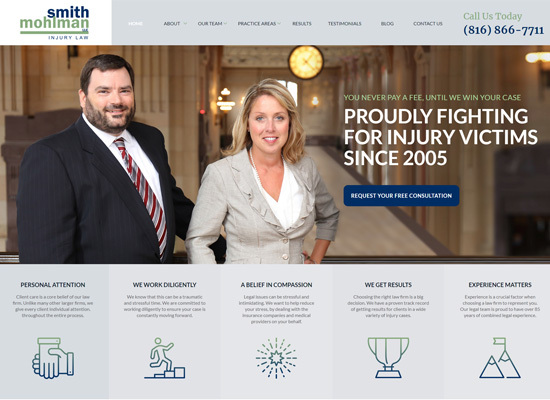 Personal injury law is a key component of the Smith Mohlman attorneys’ expertise. We believe that before pursuing any kind of personal injury claim, our clients fully understand the claims process, personal injury law in Kansas and/or Missouri, and how exactly we can help. It’s critical to speak with a Kansas City personal injury attorney as soon as possible to determine what state’s law would apply to your particular accident or injury, in addition to the exact time period you have to work within in order to file your lawsuit. If you’ve been injured as a result of a personal injury accident, contact our Kansas City personal injury lawyers to determine your particular statute of limitations and claims for a personal injury lawsuit. Contact our offices at 816-866-7711 or directly through the Contact Us form for a free consultation. Find out if you have a case today!